This entry is part 1 of 3 in the series Belgium Travel Guides. Some of our most frequently asked questions about travelling to Belgium are regarding itineraries to maximise precious holiday hours. While we think you could spend months (or years!) exploring Belgium, we know the vast majority of visitors only get a few weeks holiday each year. So how do you balance the concepts of slow travel with getting the most bang for your holiday buck on a trip to Belgium? Often, travellers want to take advantage of the proximity of countries in the Low Lands, and typical vacations range from 1 to 2 weeks. 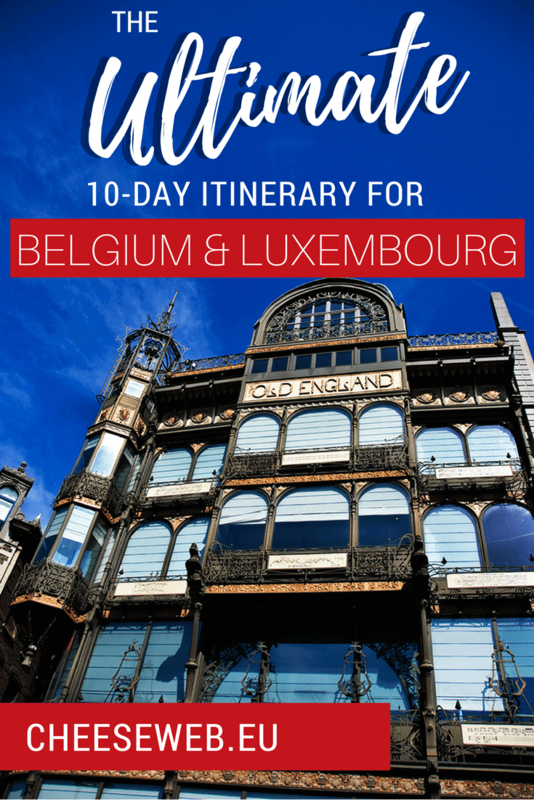 I’ve decided to split the difference and create a 10-day Belgium itinerary with a side trip to Luxembourg that will allow you to see a wide range of what each country has to offer, without leaving you feeling exhausted at the end of your holiday. Of course, this is merely meant to be a guideline. You can adapt this itinerary to suit your own needs, and I’ve given you plenty of options so you can customise to your liking. Let’s go! 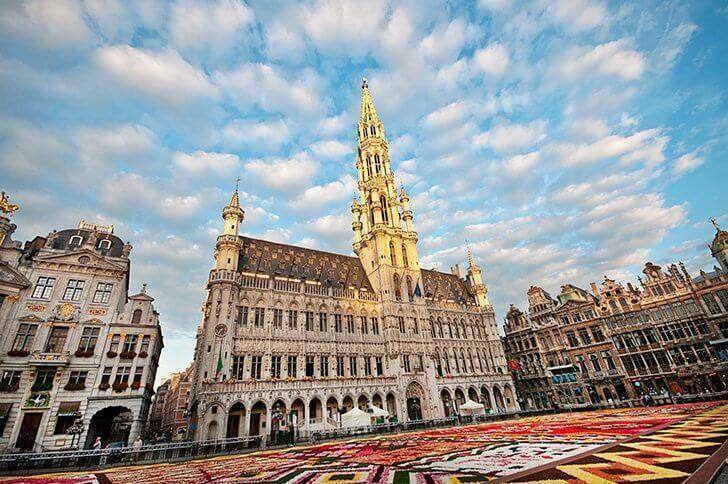 The Dominican Hotel offers a luxurious night’s sleep, just steps away from Brussels stunning Grand Place. Nestled on a quiet side street, the Dominican’s award-winning design is a contemporary interpretation of the 15th century Dominican Abbey, from which it takes its name. Enjoy a drink in the trendy lounge bar before heading out to explore the historic centre of Brussels. Check current prices here. After testing this German design hotel chain in Munich, I was thrilled when Motel One opened in Brussels Centre. While the word ‘motel’ may conjure up images of seedy roadside stop-over spots to North Americans, this hotel is anything but. What the rooms lack in size they make up for in amenities and design. This is a beautiful, clean, modern design hotel, just minutes away from Central Station all for a very wallet-friendly price. Check current prices here. 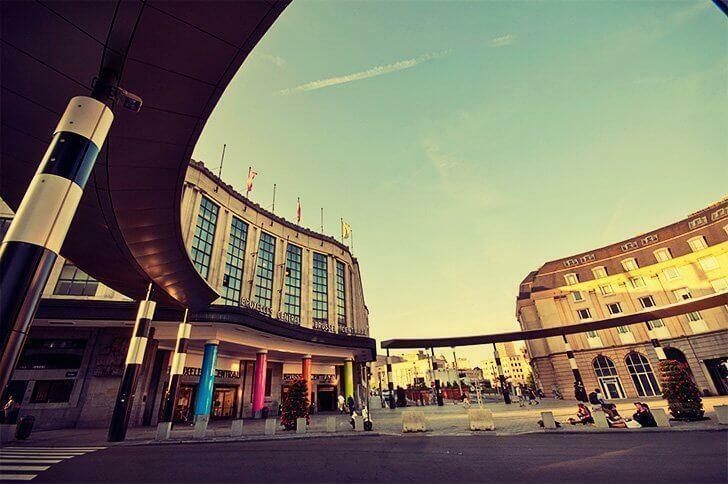 Arrive in Brussels at Central Station – close to some excellent hotel in the city centre. Today is light on activities to give you time to arrive, battle jet-lag, and give you time to settle in at your hotel and get your bearings. Give yourself plenty of time to get from the airport to the city centre, especially if you’re arriving during rush hour (anywhere from 7-9am and 4-7pm). TOP TIP: Save money (and traffic frustration) by taking the train, located in the basement of the airport direct to Central Station (which is a short walk to both hotels listed above). The train journey takes 15-25 minutes and a standard-fare, one-way ticket costs €8.90. If you opt for a taxi, the trip can take anywhere from 30 minutes to several hours (in peak-traffic) and cost upwards of €45. Window shop through the world’s oldest covered shopping mall. 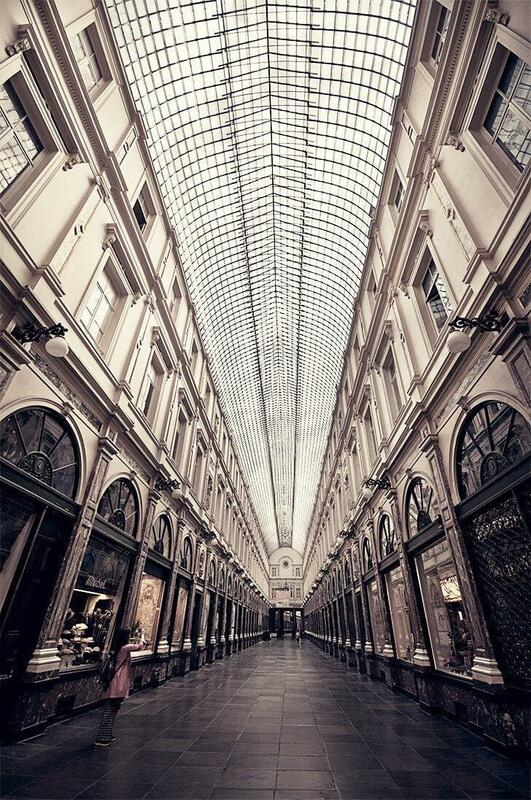 From your hotel, pass through Europe’s first covered shopping arcade, the Galeries Royales Saint-Hubert. 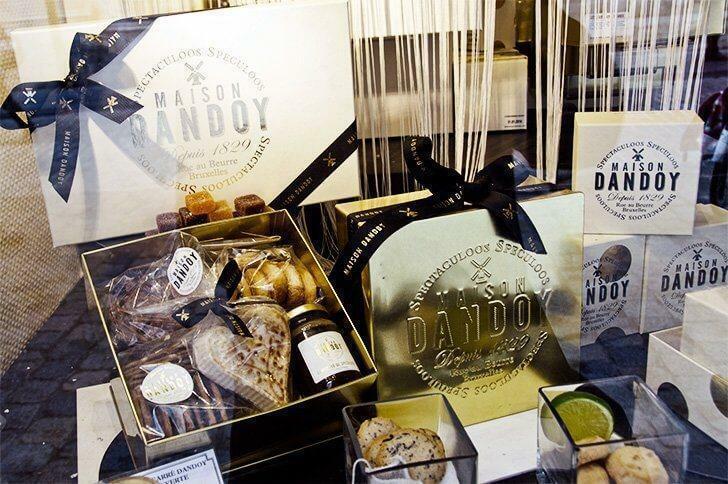 Window shop for luxury goods or taste test some of Belgium’s best chocolates (but save room for your chocolate experience in Sablon on Day 3!) on your way to Grand Place. If you’re feeling peckish, pop into Arcadi Café at the far end of the Galeries. This Belgian classic is a favourite for their wide selection of homemade quiches and pastries. If you’d prefer to dive right into the Belgian Beer scene, across the street from Arcadi, you’ll find A La Mort Subite (the sudden death). This classic Belgian bar dates from 1928 and offers a selection of Belgian beer varieties including Gueuze, Lambic, Cherry, Raspberry, and Peach. Don’t miss seeing the UNESCO World Heritage Site listed Grand Place at night. While the square bustles with tourists and locals during the day, in the evening it is quietly elegant, under the lights of the Brussels Town Hall and Maison du Roi. Visit Grand Place during the early morning, to best admire the detailed carvings on the guild-houses surrounding the square. Try to guess the guild by the decorations on each building. You probably won’t be too surprised to learn; the largest guild-house is owned by the Belgian Brewers Association. For more insight on the buildings and Brussels history, consider arranging a guided tour. Options range from free walks with locals to exclusive custom tours on a theme of your choice by foot, bike, or vehicle. You can’t come to Brussels without a visit to this guy! 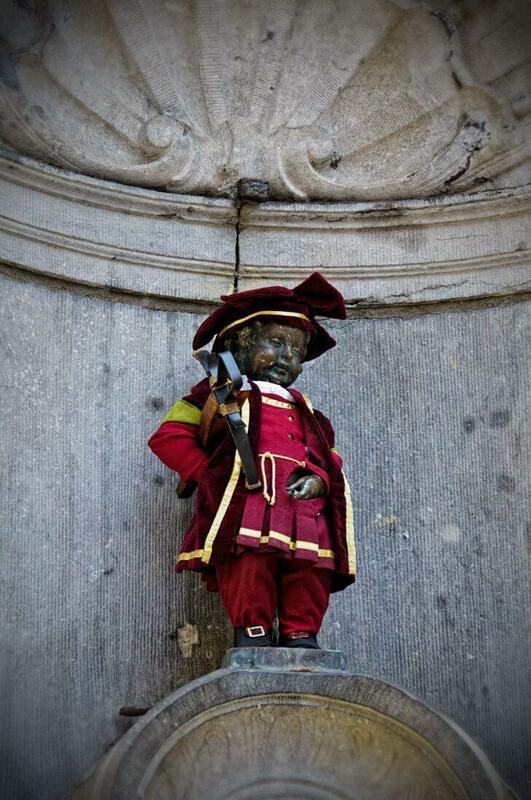 You can’t visit Brussels without a quick visit to the city’s dubious mascot. You can check the schedule ahead of time to see if he’ll be sporting one of his 900+ costumes. If you have time, check out his entire wardrobe at the Brussels City Museum on Grand Place. This recently renovated museum highlights Brussels history and achievements and includes a stunning display of art and tapestries. 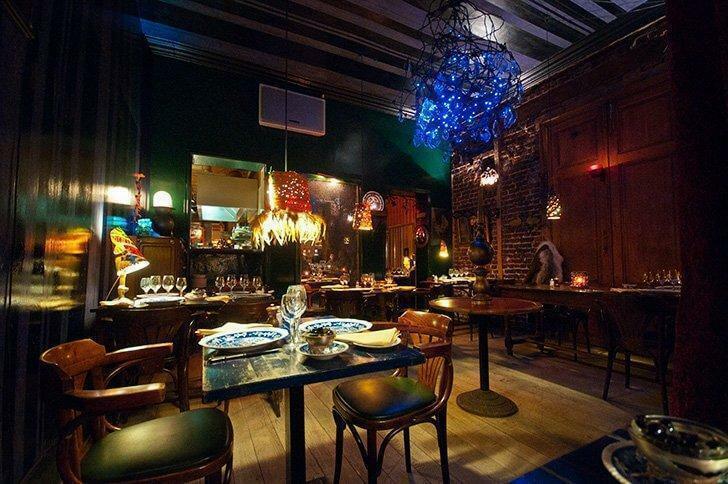 Pretty Monts des Arts is a hub for Brussels cultural scene. 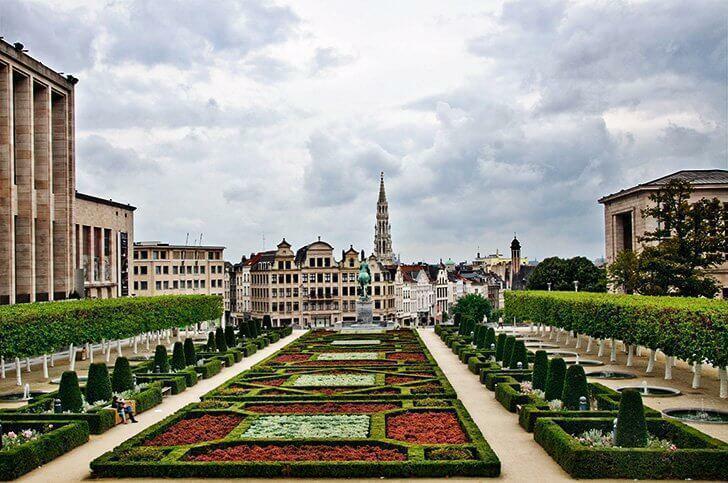 Mont des Arts is home to some of Belgium’s best museums and architecture. Wander through the small formal garden before heading up the stairs towards Place Royale. Don’t forget to look back towards the arch, to see the unique Jacquemart Carillion clock with 24 bells. From the top of the stairs is one of the best views of central Brussels. From here you can see the spire of the Town Hall building and, on a clear day, all the way to the Atomium. Located in one of Brussels most stunning buildings the Musical Instrument Museum or MIM is one of the city’s most unique museums. The collection includes over 7000 instruments from around the world. As you wander through the collection, your audio-guide, included with the price of admission, automatically starts to play the music of the instrument you are standing beside. Be sure to visit the museum cafe on the top floor as its terrace offers one of the best views of central Brussels. Alternatively, learn about the history of Brussels and visit the remains of its former palace at the BELvue Museum and Coudenberg Palace. The BELvue offers a condensed and interactive history of this tiny, yet diverse country. Beneath the BELvue, lies the entrance to Coudenberg, which was entirely lost until 1986. While workers were creating the Mont des Arts we know today, they unearthed the remains of the 12th-century palace of the Dukes of Brabant. Inside the site, you are underneath the busy Place Royal. (You can even feel the trams rumble by overhead). You eventually emerge on the other side of the square in a museum of findings from the dig. The Royal Museums of Fine Arts comprises six different museums and more than 20,000 works of art. Located on Mont des Arts, you can find the Musée Old Masters Museum, the Musée Modern Museum, the new Musée Fin-de-Siècle Museum, and the Musée Magritte Museum. Visit any combination of eras that interest you. 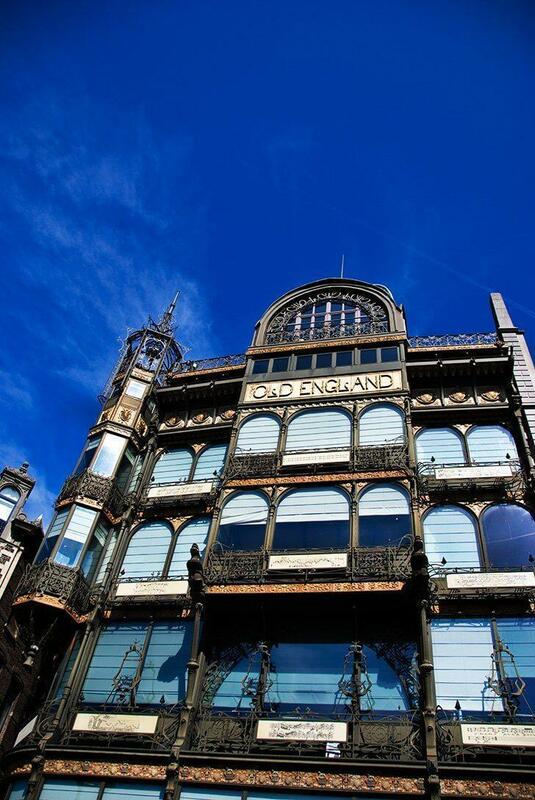 (My favourite is the Fin-de-Siècle Museum highlighting the stunning Art Nouveau and Art Deco periods). To get a handle on Belgian Surrealism, don’t miss the Rene Magritte Museum, dedicated to the country’s most famous surrealist painter. Read more about Brussels Best Museums in this article. Begin your day by strolling through Brussels’ lively Marolles neighbourhood, where you can see one of the remaining towers of the former city walls. Walk up Rue Haute (Hoogstraat in Flemish) towards Place du Jeu de Balle and explore some of the quirky boutiques and antique shops along the way. 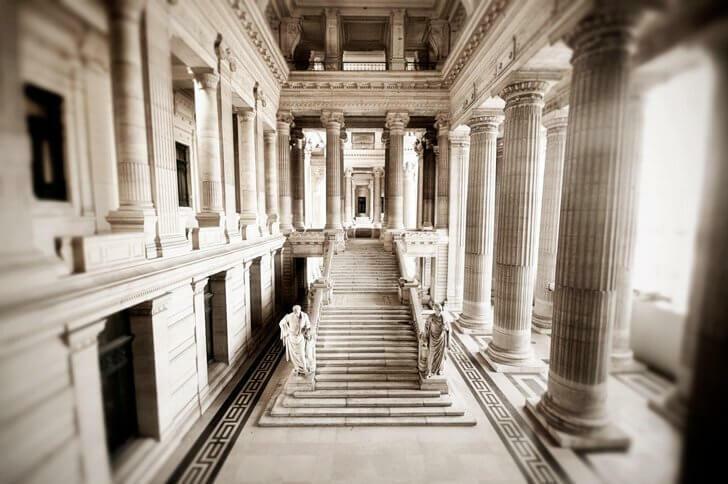 Take the elevator at Zwardstraat, up to Place Poleart to admire the Palais du Justice, Brussels Supreme Court. Don’t be afraid to step behind the scaffolding to admire the architecture of this enormous building, larger than St. Peter’s Basilica in Rome. If your adventure through the Marolles makes you peckish, stop at one of the city’s best Friteries (French fry stands) at Place de la Chapelle. Belgians invented French fries and take cooking them very seriously. Fries are hand cut and deep fried twice at two different temperatures to make the inside soft and the outside crisp. Try one of the dozens of different sauces and enjoy your frites like a local. From the Palais du Justice, head down Rue de la Régence towards Place du Grand Sablon, known by locals as Chocolate Square. Here you will find Brussels’ top chocolatiers in one convenient location. Two not to miss are traditional Wittamer, chocolatier to the Belgian Royal family, and Pierre Marcolini, whose luxurious shop resembles a jewellery store. If you’re in need of a pick-me-up, head to the Wittamer Cafe, upstairs from the pastry shop and order their Véritable chocolat chaud Wittamer. This restaurant is everything I love about Brussels. It’s small and intimate, has knowledgeable and friendly staff, is hard to find and open at odd times, has a very short hand-written menu of seasonal dishes, and has a quirky, fun interior. You absolutely need reservations. Jog, walk, stroll, or just sit and people watch in Parc Cinquantenaire. 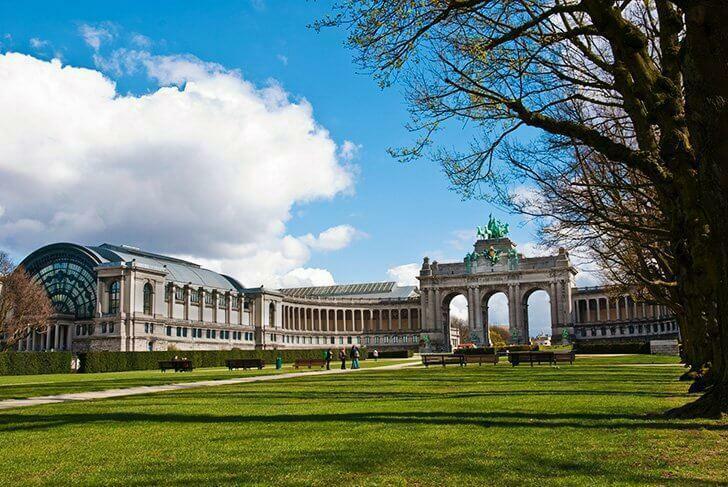 Begin your day in Parc du Cinquantenaire. Admire the triumphal arch commemorating the fiftieth anniversary of Belgian independence. For a view of the entire 40-hectare park, you can access the top of the arch through the free Royal Military Museum. Opposite the Military Museum, you can visit the 350 vintage vehicles at the AutoWorld Museum. Or, head instead to the excellent Cinquantenaire Museum, part of the Royal Museums for Art and History, for their collection of antiquities from civilisations from around the world. There’s a unique collection of Art Nouveau decor inside as well. For lunch, sample Brussels’ seafood favourites at Noordzee (Mer du Nord in French). Located on Place St. Catherine, this fishmonger’s snack counter is a local favourite. On cold days, warm up with their delicious fish soup or enjoy a plate of fresh oysters with champagne, for a decadent afternoon. Whichever you choose, be sure to sample Belgian shrimp croquettes, crispy on the outside and filled with tiny, sweet grey shrimps from the North Sea. You can’t visit Brussels without sampling some of the hundreds of Belgian beer offerings. Avoid the overly touristy Delerium Bar and head instead to Moeder Lambic, where they are trained to educate you all about Belgium’s best brews. If you aren’t full after Noordzee, order a cheese plate and taste some of Belgium and France’s best dairy products. The afternoon is all about Brussels Art Nouveau and what better place to learn about the city’s most renowned architectural style than the home of its most famous architect. The Horta Museum is located in Victor Horta’s former studio on Rue Américaine in the Saint-Gilles neighbourhood. After the museum, go for a stroll through the surrounding streets to admire the beautiful Art Nouveau details. In addition to the Horta Museum, Rue Américaine is also home to a lively restaurant quarter, popular with locals and expats. You’ll find a wide variety of cuisines to choose from. Try the excellent Mexican at Chez Wawa or authentic Italian at La Piola or simply grab a spot anywhere busy and bustling. If the choosy locals love it, it’s likely a good choice. Get up early to enjoy the scenic route to Luxembourg. Take a break from driving at Villers Abbey, in Villers-la-Ville. 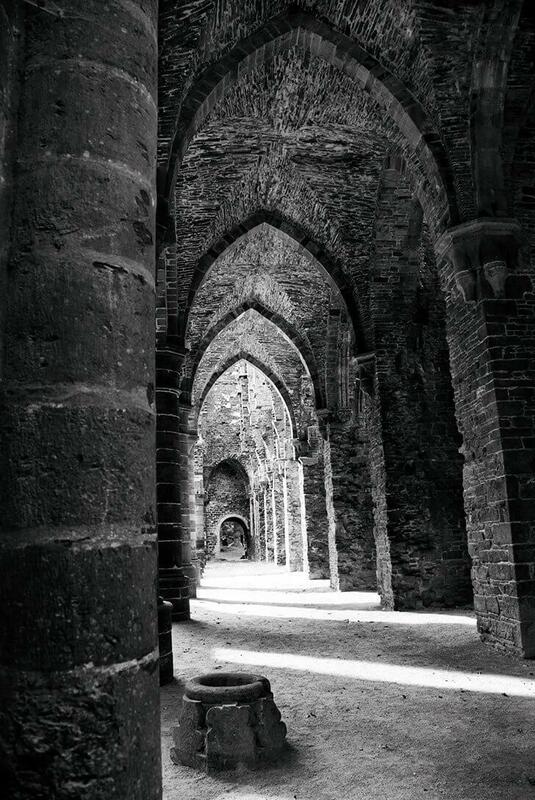 This crumbling Cistercian abbey is filled with atmosphere and history. Wander through the medicinal garden and restored abbey vineyard. Walk through the pretty little town of Villers-la-Ville and grab a bite to eat at one of the local cafes. Make your next pit-stop at Bastogne, to visit the city liberated by the Allies in 1944. Visit the Mardasson Memorial, just outside the city, honouring the American soldiers wounded or killed during the Battle of the Bulge. Then head to the excellent Bastogne War Museum, opened in 2014. Military history buffs will also enjoy the Bastogne Barracks and Vehicle Restoration Center. If you have limited time and/or aren’t up for driving yourself, there is an excellent bus tour option from Brussels. The 12-hour day-trip covers Luxembourg City, Dinant, and a stop at the Mardasson-Memorial at Bastogne. Our top pick for the best hotel in Luxembourg for the next two nights is the lovely countryside boutique hotel La Gaichel in Eischen. 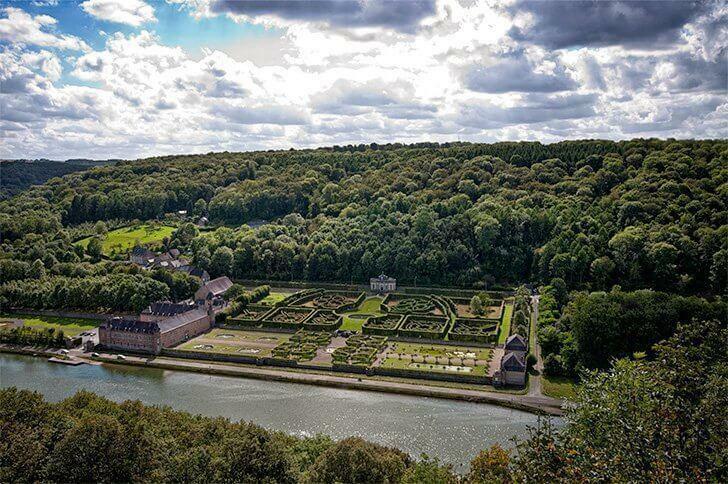 Located in the heart of Luxembourg’s “Valley of the Seven Castles” la Gaichel ideally placed for exploring this beautiful region and is a short 30-minute drive to Luxembourg City. Enjoy fine dining in their Michelin-Starred restaurant and walking through their exquisite gardens and parkland. Check current prices here. A great budget hotel in Luxembourg is the Hotel Martha, in Beringen. The hotel is under 20km to Luxembourg City and doesn’t skimp on amenities. There’s a full-service restaurant offering Luxembourgian and French specialities, a free sauna, and on-site bakery. Check current prices here. Spend the day in Luxembourg City exploring by foot. Visit the UNESCO listed city fortifications, the Casemates Bock, built in the 18th century. Enjoy the view from the Viaduc (Passerelle), stroll through the pedestrianized Old Town, visit the lovely Notre Dame Cathedral and admire the architecture of the Palace of the Grand Dukes (Palais Grand-Ducal). For an easy way to get around and an overview of the city’s history, book a seat on the Hop-On-Hop-Off Bus tour. While dining in Luxembourg is an expensive experience at the best of times, the exclusive Clairefontaine Restaurant offers an economical four-course lunch menu for 57€ (excluding drinks). The restaurant is cosy, yet elegant and provides a fine-dining experience making it a local favourite. 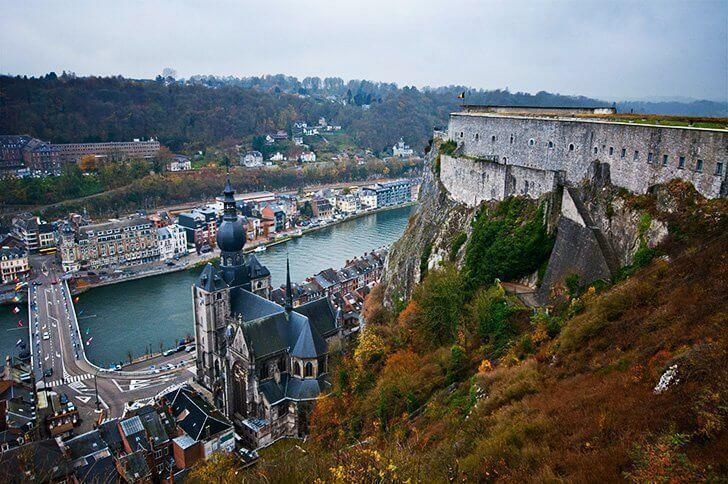 Don’t miss Dinant. The city is a top attraction in Belgium. Return to Belgium taking in one of its most scenic drives along the Meuse River. First, drive to Dinant on the E411 highway. Stop in the city to take in the dramatic Citadel and Notre-Dame Collegiate Church. Watch out for the many saxophone statues decorating Dinant, the birthplace of Adolphe Sax. In the heart of Dinant, dine at the small and intimate La Broche restaurant. Monthly lunch menus feature seasonal, local ingredients for 20€ (or 26€ including two glasses of wine.) Service is warm and friendly and the dishes are hearty yet elegant. Visit one of Belgium’s most famous castles, the Chateau de Freyr. If the weather is co-operative, double back to Freyr to visit one of Wallonia’s most famous castles. Then continue along the Meuse River (Route N69) to the fortified city of Namur. 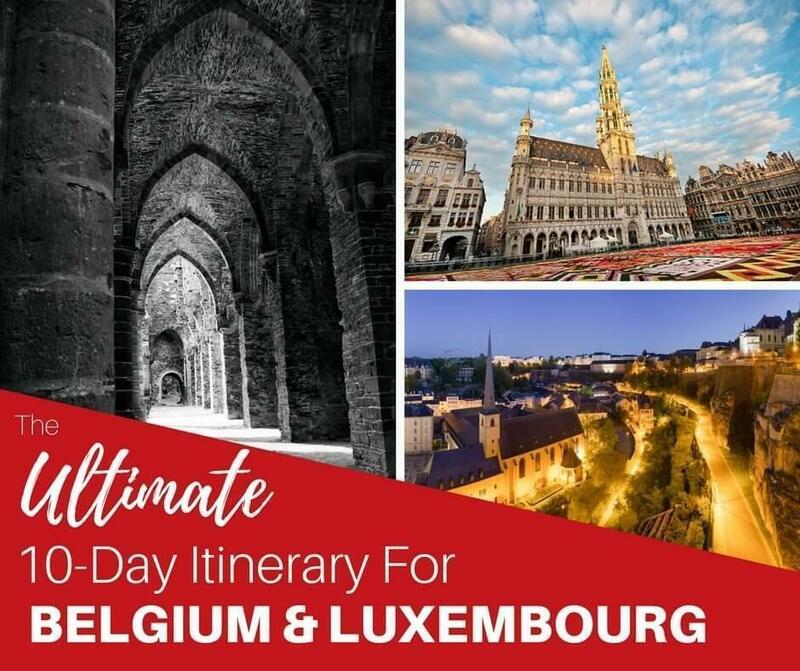 From Namur, hop on the highway (A4-A10) to the Flemish city of Ghent, where you will spend your final days in Belgium. The Marriott Hotel in Ghent is no ordinary chain hotel. Located in a historic building on the beautiful Graslei waterfront, the location doesn’t get any better than this in Ghent. The exterior of the hotel, facing the water, is beautifully restored and blends seamlessly into the surrounding architecture. The interior public areas are bright and airy and the rooms are modern and spacious. Underground parking and wifi are available. Request a room on the top floor for a view of the castle. Check current prices here. This charming 2 room B&B puts you in the heart of the art gallery district just a 15-minute ride on public transport from Ghent’s historic centre. With an exceptional breakfast, a lovely terrace and garden, and access to a shared kitchen, you may never want to leave. This is an excellent option for families. Check current prices here. What better way to experience the canal city of Ghent than by staying on a boat? Smack in the middle of the historic city centre, you can fall asleep to the lapping water. Enjoy a fabulous breakfast while being in the heart of the action and have a great story to share with your friends back home. (I bet they’ve never slept in a boat hotel!) Check current prices here. 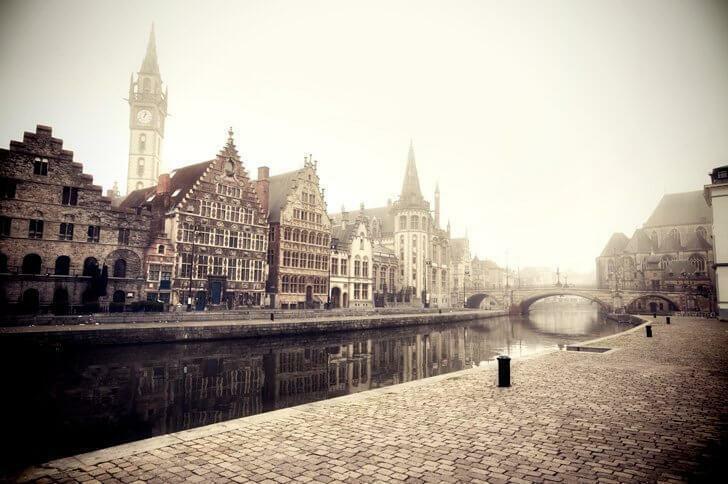 Alluring Ghent – One of our favourite cities in Belgium. Start your day in Ghent by strolling along the Graslei waterfront on your own or with a private guide. You can catch one of the popular canal boat tours here, or continue on foot to the imposing Gravensteen Castle. The ‘castle of the Count’ dates from 1180 and was the seat of the Counts of Flanders until the 14th century. The castle served as a courthouse, a prison and even a factory and was slated to be demolished at the end of the 19th century. Luckily, it was saved and, over the years, it has been restored and opened to the public. Inside is a rather gruesome display of torture devices used in Ghent’s past. The highlight of a visit to the Gravensteen is the view from the ramparts of Ghent’s stunning skyline with its three medieval towers and many historic buildings. If you fancy an original drink, stop by Ghent’s Gruut Brewery for a unique brew. The name comes from Gruit, an old-fashioned spice and herb mixture popular before the use of hops. There are five beers to choose from, and you can enjoy them inside the modern brewery cafe or canal-side on the terrace. Compare Flemish canal cities with a day-trip to Bruges. The historic centre is on the UNESCO World Heritage Sites list and is picturesque if crowded in the high-season. In the off-season, you should have the city-streets more-or-less to yourselves to enjoy the canal-side restaurants and shops. 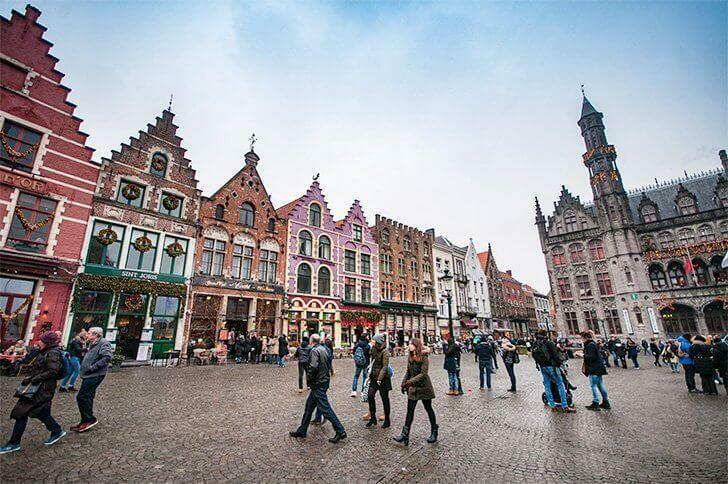 Visit the interactive Historium Museum, the city’s famous belfry and the tranquil begijnhof. 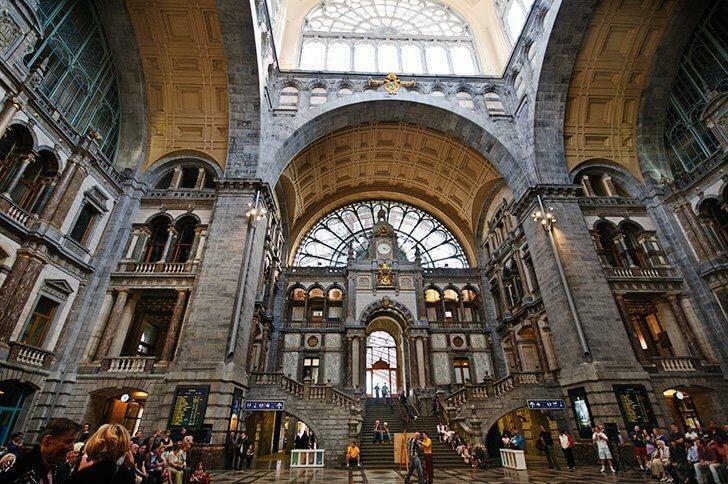 The stunning interior of Antwerp’s central train station. Alternatively, make your day-trip to bustling Antwerp. Leave your car parked safely in Ghent and take the reliable Belgian rail system to arrive in style at the country’s most beautiful train station. Head to the Grote Markt (Main market square) to admire the architecture of the town hall and the stunning Onze-Lieve-Vrouwekathedraal (Cathedral of our Lady). Don’t miss the fountain that shows the (rather gruesome) legend of how Antwerp got its name. Legend has it, the giant Antigoon forced everyone who passed on the river Scheldt to pay a toll. If they refused, he cut off their hand and threw it in the river. Silvius Brabo, a Roman soldier, killed the giant and threw his hand into the Scheldt. The name Antwerp is said to have come from the Flemish hand werpen (hand throw). From the Grote Markt, continue a little further to the Scheldt waterfront to view Antwerp’s bustling port and Het Steen castle. There can be no more dramatic place to enjoy a coffee or take your lunch than the Bourla theatre’s cafe, De Foyer. Dine in style under the stunning high-ceilinged cupola beside windows dripping with red velvet curtains. The dessert cart alone is worth the trip. 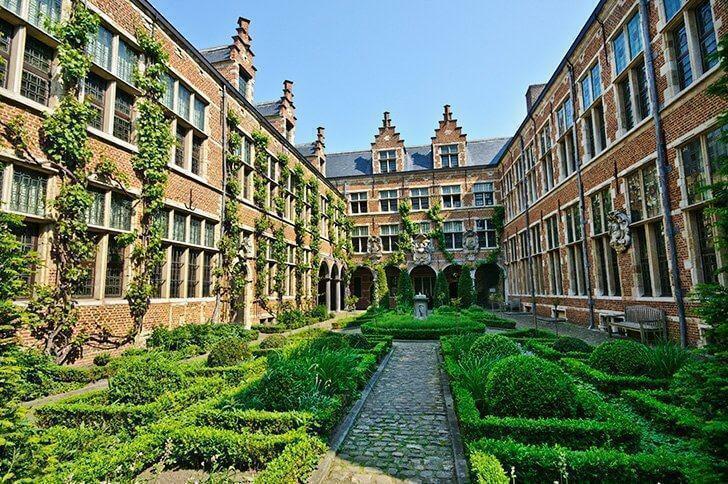 The Plantin Moretus Printing Museum in Antwerp is the only museum on the UNESCO World Heritage sites list. While it may sound a bit dry and boring, the under-rated Plantin Moretus Printing Museum is such a gem, it was recognised by UNESCO as part of the Memory of the World Programme in 2005. The collection of rare books and manuscripts, as well as the world’s oldest printing presses, not to mention the beautiful house and garden, are but a few reasons not to overlook it. Don’t forget to stock up on chocolate and Belgian beer! Although Belgium has three official languages (French, Flemish and German) which language you speak where can be a very touchy subject. In Northern Flanders, Flemish (the Belgian form of Dutch) is spoken. In southern Wallonia, the language is French. German is only used in a tiny area called the Eastern Cantons. When in doubt, it is better to default to English than speak French to a Flemish person or vice-versa. Tipping for good service in restaurants is generally accepted, however, most Belgians typically just round off the bill as most places already include a service change. Belgian drivers are known for their aggressive style, and there are several rules of the road here that trip up foreign drivers. One worth reading up on is the priority to the right rule. Marked by an inverted “yield” sign with a red “X” in the middle, the “priority from the right” rule means that cars coming from the right always have priority, unless a yellow diamond sign or other priority road sign has been posted. This does not apply on motorways, roundabouts, and roads sign-posted with an orange diamond within a white background. Driving in Brussels is not recommended, nor is it necessary with the city’s excellent public transportation network. Belgian weather is erratic and often rainy. Pack and wear plenty of layers and always have a waterproof coat and/or umbrella handy. Public transportation in Brussels usually is reliable and is an affordable way to get around the city. Purchase a “10 jump card” and validate it each time you use the metro, tram or bus. One “jump” is good for an hour of travel within the entire Brussels system, allowing you to transfer from metro to bus, or tram, within that time frame. Belgian customer service can be a bit frosty, particularly in Brussels. Don’t take it personally. In good restaurants, the service will be efficient and pleasant but less forceful than in America. You must always ask your server for the bill, as it is considered rude and pushy for them to bring it to you before asking. Some of Belgium’s best foods are perfect for picnics. For an affordable lunch pick up a fresh baguette, some local cheeses and salamis to eat on the go. Don’t forget a bottle of wine (bring a corkscrew) or some Belgian beer, to quench your thirst. For a hearty and traditional local dish, try Carbonnade a la Flamande (French) Stoofvlees (Flemish). This is essentially beef, stewed in Belgian beer until it melts in your mouth. It is typically served with Belgian Frites or mashed potatoes. With almost 180 breweries in this tiny country, by all means, be sure to sample a variety of Belgian beer. Just beware of its alcohol content. Belgian beer is much stronger than most American brands; some are well over 10%. Hopefully, you will never need to use them, but the Pan-European Emergency Services number is 112. This number can be dialled for free from any phone, including mobiles. The Belgian fire and medical emergency number is 100 and for police dial 101. Some links to hotels and activities in this article are affiliate links meaning we will make a small commission at no extra cost to you. Please know we will never recommend a product or service we would not use ourselves.